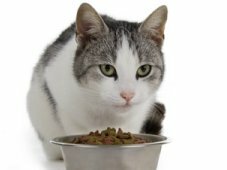 Cats may confuse their owners by ending their grazing session by regurgitation or vomiting. The reason for this predictable (and apparently normal) behavior is unclear, but it has been suggested that our pets eat grass, at least sometimes, in order to stimulate vomiting. Relief from hairball indigestion (caused by swallowing hairs during grooming) may be one motive for eating plants. However, not all plant-eating leads to vomiting, so it is a good idea to consult with your veterinarian if the pattern continues. Because of this tendency to eat vegetation, cats may naturally experiment with the taste of houseplants. At best, this behavior is annoying, since it can damage or kill your plants. At worst, it can be deadly when leaves or other plant parts are toxic. To keep your cat safe, be sure all plants in your home are nontoxic. Some toxic plants, and plants that may irritate the digestive tract, are listed at the end of this article. Your veterinarian can provide or refer you to a more complete list. Just to be safe, place all plants out of reach. Hanging pots, for example, usually lose their appeal even to curious cats. Non-toxic, but valued, plants can also be protected with a small amount of vinegar or black pepper solution sprayed on leaves. We sure to thoroughly wash even nontoxic plants as soon as you bring them home. Plants nurseries sometimes spray plants with poisonous substances to keep them bug-free or to make the leaves shine. A quick shower before you put the plant where kitty can reach it will avoid a potential disaster. 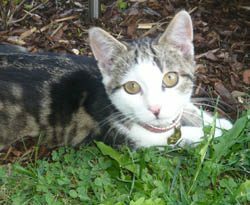 As a gift to those cats who seem determined to eat plants, you can offer treats of potted grass (herbicide- and pesticide-free, of course). Grass seeds, or even seeds for parakeets, can be sprouted in seedling pots and offered occasionally, with the empty pot then re-seeded for a new batch. In small amounts, grass can be a welcome treat for any housecat. Should your feline friend eat part of a poisonous plant, rush the cat to your veterinarian as soon as possible. If you can, take the plant with you for ease of identification. An important phone number to keep handy is (888)426-4435-the ASPCA Animal Poison Control Center. Listed here are plants that are poisonous or otherwise dangerous to cats and that must be avoided if there are cats in your home. While in some cases, just parts of a plant (bark, leaves, seeds, berries, roots, tubers, spouts, green shells) might be poisonous, this list rules out the whole plant. Daffodil, Daisy, Datura, Day lily, Delphinium, Dieffenbachia? Easter lily, Elderberry, Elephant ears, English ivy, English yew? Geranium, Golden chain, Ground cherry? Hibiscus, Holly, Honeysuckle, Hyacinth, Hydrangea? Impatiens, Indian rubber plant, Iris, Ivy? Jack-in-the-pulpit, Japanese yew, Jasmine, Jerusalem cherry? Larkspur, Laurel, Lily of the valley? Majesty, Malanga, Marijuana, Mistletoe, Moonweed, Morning glory, Mother-in-law’s tongue, Mushroom? Narcissus, Nephthytis, Nettle, Nightshade, Norfolk pine, Nutmeg, Nux vomica? Peach, Periwinkle, Philodendron, Poinsettia, Poison hemlock, Pokeweed, Potato? Schefflea, Skunk cabbage, Spinach, Sweet pea?